Seattle Seahawks (11-2) – The Seahawks lost a closely contested game against the reigning NFC Champion, one of the elite teams in it’s conference, on the road. Thus, they remain atop the rankings. Denver Broncos (11-2) – The only reason they didn’t jump the Seahawks was because they were playing lesser opposition at home. They remain well on track for homefield advantage in the AFC. New Orleans Saints (10-3) – Coming off their humbling loss to Seattle, the Saints put the surging Panthers in their place with a resounding victory on the road. Just like with the ‘Hawks, I don’t see anyone winning against the Saints in their place. 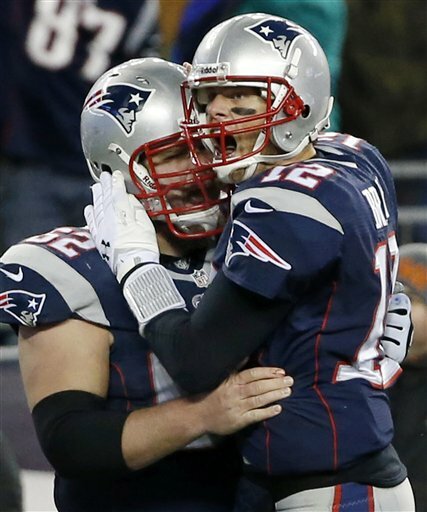 New England Patriots (10-3) – . . . What? What just happened? Tom Brady and this team have pulled off perhaps the three most improbable victories in Patriots history this year (against the Saints, Broncos and Browns), and their odds of winning the last three games, being down 10+ points in the second half in each of them: 1 in 18,248. This team has been decimated by the injury bug, but you can’t say they lack resilience. San Francisco 49ers (9-4) – The Seahawks may still be firmly entrenched in first place in the division, but the 49ers have sent a message to the league: we’re the same team that was one touchdown from winning the Super Bowl last year, and we’re just as dangerous. Kansas City Chiefs (10-3) – Following three straight losses, the Chiefs righted the ship with a convincing defeat of Washington. Up 38-10 at halftime, the Chiefs coasted the rest of the game, and look to at least have the #5 spot in the AFC well in hand. Carolina Panthers (9-4) – One loss against an elite team in one of the hardest stadiums to play does not widespread panic justify. This team still has wins over the 49ers and Patriots to prove it belongs with the big boys. Cincinnati Bengals (9-4) – Bengals fans must be on Cloud Nine: their team has secured its fourth winning season in the last five years, a streak of success the franchise has never had, until now, in its 46-year history. Philadelphia Eagles (8-5) – The team many pegged to contend for a Top-5 spot in the 2014 Draft now has sole lead of the NFC East for the first time this season. As such, they “control their own destiny,” meaning that if they win out, they’ll be playing at Lincoln Memorial in the opening round of the playoffs. Arizona Cardinals (8-5) – It’s unfortunate this team is in a conference where both Wild Card teams could win 12 games. We could be facing a situation where an 11-5 team misses the playoffs, which would only be the 3rd time (following the 1985 Broncos and 2008 Patriots) such a thing occured. Indianapolis Colts (8-5) – This team reminds me of last year’s Ravens – starting out the year strong, looking like one of the elite teams in the conference, then faltering down the stretch but still clinching the division and a Top-4 seed. Could their playoff fate be similar to the 2012 champs as well? Detroit Lions (7-6) – Blizzard conditions noticeably hindered the Lions’ prolific attack, but since they’ll be playing in a dome for the remainder of the regular season, I wouldn’t be too worried about their immediate offensive woes. Chicago Bears (7-6) – With Josh McCown looking like the best Bears quarterback since Sid Luckman and the defense looking like it’s rounding into form, the Bears now need to win out and a Lions loss to claim their first NFC North crown since 2010. Baltimore Ravens (7-6) – The Ravens now too, to use the paradoxical phrase again, “control their own destiny,” and are in the driver’s seat for the #6 seed in the AFC playoffs following a game which saw 36 points scored in the final 2:06 of regulation. Miami Dolphins (7-6) – The Dolphins face a tougher road than the Ravens, but remain in a better position to snag a Wild Card than any team other than Baltimore. Anything can happen. It’s going to be a wild last three weeks. What do you think? Agree? Disagree? Let us know in the comments section below!